God gave Israel seven feasts as appointments to remember Him, to worship and thank Him, and to remind them of their dependence upon Him. These feasts also have a dual purpose of being a prophetic picture of the past, present, and future ministry of Messiah Yeshua (Jesus). Please keep in mind that the original Passover took place approximately 1,500 years before Yeshua was crucified. 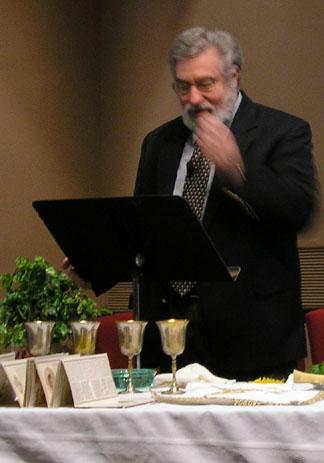 In 2010 the series of feasts begins with the Passover at sundown on March 29. The Jewish day begins and ends at sundown. Concurrent with the celebration of Passover is the Feast of Unleavened Bread. Jews are to refrain from eating any food that contains leaven. In 2010 the feasts will end at sundown on April 6. Jewish people and their non-Jewish friends send each other Passover cards. Here is an Internet site that you can use to send people free Passover cards. The Passover is a celebration of how God took a group of helpless slaves and set them free from one of the most powerful rulers in the world, Pharaoh. Pharaoh had a vast army, weapons of warfare, and the obedience of his people. The Israelites were unarmed and without any resources to rebel against their powerful slave master. Except that they had the God of Israel on their side. Slavery was a miserable situation. Your masters could work you to death, separate your family from each other, and in general make your life miserable. The Israelites cried out to God, and He raised up Moses and Aaron to set them free. With miracles and great power, God set them free from their hopeless situation. Have any of you ever been a slave? Have you ever felt like a slave? The truth is that all of us are or were slaves. According to the Scriptures, we're all born with a sin nature. We are helpless, like the Hebrew slaves, to escape this sin nature. If I was the fastest track runner in the world, could I run away from my skin? Of course not! Likewise we cannot escape our sin nature by trying to be good. However, when we believe in Yeshua, we are liberated from our slavery to sin. We have a new power through Yeshua to struggle against sin and have the victory. I am not saying that we become perfect and without sin, but we can change, and one-by-one overcome different sins. The door of freedom has been kicked open by the liberating power of Yeshua. And, praise the Lord, God our Father has forgiven us through the atoning work of Messiah Yeshua. This is a day you are to commemorate; for the generations to come you shall celebrate it as a festival to the LORD--a lasting ordinance. For seven days you are to eat bread made without yeast. On the first day remove the yeast from your houses, for whoever eats anything with yeast in it from the first day through the seventh must be cut off from Israel. On the first day hold a sacred assembly, and another one on the seventh day. Do no work at all on these days, except to prepare food for everyone to eat—that is all you may do. Over the years the Jewish people developed ceremonies for the Passover Seder Meal (seder means the order of service). Each ceremony was a reminder of the Exodus story, with the exception of one tradition which I will discuss later. Then came the day of Unleavened Bread on which the Passover lamb had to be sacrificed. Jesus sent Peter and John, saying, "Go and make preparations for us to eat the Passover." "Where do you want us to prepare for it?" they asked. He replied, "As you enter the city, a man carrying a jar of water will meet you. Follow him to the house that he enters, and say to the owner of the house, 'The Teacher asks, 'Where is the guest room, where I may eat the Passover with my disciples?' He will show you a large upper room, all furnished. Make preparations there." They left and found things just as Jesus had told them. So they prepared the Passover. In an observant Jewish home, there is a thorough cleaning of the home with the goal of removing all leaven crumbs and food. When I grew up, we were too poor to afford to throw away our leavened food. So we would pack all our leavened food in a box and sell it to our Irish neighbor, Mrs. Kelly. She would keep it for us and when the Passover was finished we would buy it back. My mother would also hire a cleaning woman and together they would completely clean everywhere to make the home ready for the Passover week. After Mom had done all this hard work, she would leave a few crumbs for Dad to do the official ceremonial cleansing. Dad would gather us kids and walk around with a candle, a feather, and a wooden spoon. He would act like he didn’t know where the remaining leavened crumbs were and finally he would "find them." He would sweep them onto the spoon with the feather and go to the back door where our yard was. He would pray to God that we had cleansed the home according to His command and then would drop the crumbs into a small fire he had prepared in the backyard. Leaven is a symbol for sin in both the Old and New Testaments. In the Old Testament leaven is often forbidden from being included in offerings before the Lord (see Exod. 29:2; Lev. 2:4-5, 11; 6:16-17; 7:12-13) Example: Lev. 2:11 "Every grain offering you bring to the LORD must be made without leaven, for you are not to burn any leaven or honey in an offering made to the LORD by fire." Similar New Testament passages would include Matthew. 16:11-12; Mark 8:15; Luke 12:1; and Galatians 5:9. Unleavened bread represents sinlessness. God was symbolically cleansing Israel of sin for 7 days (see Lev. 23:6). We will see what prophetic significance this has later in the Seder. Meanwhile, Mom would prepare a luscious meal with all the trimmings, except for leavened bread. The Passover Seder is a family gathering event. It is like having a Thanksgiving or Christmas dinner. Each year the Passover would be in a different home among our extended family. Blessed art thou O Lord our God, King of the universe who has sanctified us by his mercy and has given to us Jesus the Messiah, the Light of the World, the Light of the soul. 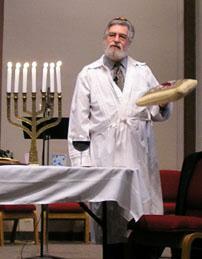 The leader of the Seder will put on a white robe (a Kittle) and a High white hat or a skull cap. The leader is playing the role of a priest in his home, and just like the priest in the Temple at the time of Jesus wore special clothes when ministering in the Temple, the leader of the Seder likewise wears special clothes. I am the LORD, and I will bring you out from under the yoke of the Egyptians. I will free you from being slaves to them, and I will redeem you with an outstretched arm and with mighty acts of judgment. I will take you as my own people, and I will be your God. We drink the first cup while leaning to the left to show the idea of being free. A pillow will be present on Elijah’s chair (more on this later) to show the idea of freedom. If you were a slave you could not relax at your meal. But in the time of the Exodus and in Jesus' time, a free man would rest by leaning on a large pillow as he sat on the floor near his food table. We see an example of this in John 13:24-25: "One of his disciples, whom Jesus loved, was reclining at table, close to Jesus, so Simon Peter motioned to him to ask Jesus of whom he was speaking. So that disciple, leaning back against Jesus..."
The wine that is drunk at the Seder is red. It is to symbolize the blood of the lamb that protected the Jewish people during the original Passover. God forbids in His Law the eating of blood (see Lev. 17:10-12). However, a vicious rumor began centuries ago that in preparation for the Passover, Jewish people will kill a young Gentile child and use the child’s blood at the Passover Seder. As a result of this horrible lie, thousands of Jewish people were slaughtered by their "Christian" Gentile neighbors. Pope Benedict XIV summarized the history of the child martyr ritual murder cases known to the Roman Catholic Church by 1755 in his Bull, Beatus Andeas. The Bull thoroughly endorsed the notion that the Jews murdered Christian children for malice or religious purposes. This was in the year 1755, not the middle ages. The Bull Beatus Andreas lists these case of children allegedly murdered by Jews, and some previous child martyrdom cases where the identify of the murderers is not made clear (see this Web site for the rest of the article and additional information; see also this Wikipedia site). After the first cup is drunk, the leader will wash his hands without any prayer. This is similar to the fact that the priests would wash themselves before serving in the Temple. Jesus Washes His Disciples Feet in John 13:4-15. He was setting an example of servanthood. Followers of Jesus are instructed in God’s word to serve one another and to give a witness of the love of God by serving their neighbor as themselves. Each of us has been gifted by God with some way to serve. If you re not doing this, pray for God’s guidance on how to begin. As the wine is red and represents the blood of the Passover lamb, so also do the greens represent the hyssop which was used to place the blood of the Passover lamb upon the door posts and the lintel (the top of the door frame). The salt water represents the tears shed in Egypt and the Red Sea, both of which are salty. 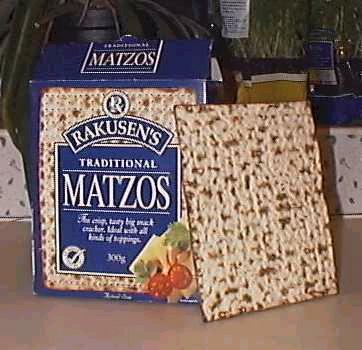 On the Passover Table, there is bag or tray that contains three pieces of matzoh. The pieces of matzoh are separated by napkins or if they are in a bag by separate compartments. The father reaches into the middle section and breaks the middle piece of matzoh in half. Then he wraps one of the halves in a white cloth, and hides it. This hidden matzoh is called the Afikomen. After the dinner is finished, the children will hunt for the hidden matzoh. Whoever finds it gets a reward from the leader, and it is the last food eaten at the Passover meal. This tradition does not tie in with the Exodus story. I’ve searched twenty Haggadahs (the booklet that contains the prayers and text used for the Passover Seder) and found a variety of explanations for this ceremony, but none them tied in directly with the Exodus story. Some simply said it’s an ancient tradition, and the Rabbis are not certain of its original meaning. Yet, each year it is part of the Seder. More on solving this mystery later. The Lord said to Moses and Aaron in the land of Egypt, "This month shall be for you the beginning of months. It shall be the first month of the year for you. Tell all the congregation of Israel that on the tenth day of this month every man shall take a lamb according to their fathers' houses, a lamb for a household. And if the household is too small for a lamb, then he and his nearest neighbor shall take according to the number of persons; according to what each can eat you shall make your count for the lamb. Your lamb shall be without blemish, a male a year old. You may take it from the sheep or from the goats, and you shall keep it until the fourteenth day of this month, when the whole assembly of the congregation of Israel shall kill their lambs at twilight. "Then they shall take some of the blood and put it on the two doorposts and the lintel of the houses in which they eat it. They shall eat the flesh that night, roasted on the fire; with unleavened bread and bitter herbs they shall eat it. Do not eat any of it raw or boiled in water, but roasted, its head with its legs and its inner parts. And you shall let none of it remain until the morning; anything that remains until the morning you shall burn. In this manner you shall eat it: with your belt fastened, your sandals on your feet, and your staff in your hand. And you shall eat it in haste. It is the Lord's Passover. For I will pass through the land of Egypt that night, and I will strike all the firstborn in the land of Egypt, both man and beast; and on all the gods of Egypt I will execute judgments: I am the Lord. The blood shall be a sign for you, on the houses where you are. And when I see the blood, I will pass over you, and no plague will befall you to destroy you, when I strike the land of Egypt." Child: "Why is this night different from all other nights?" "On all other nights we eat either leavened or unleavened bread. 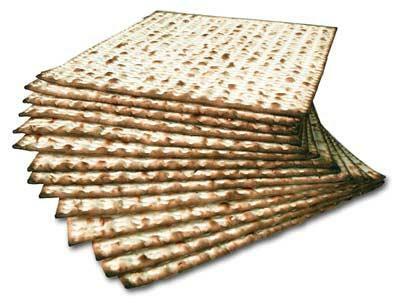 Why on this night do we eat only Matzoh which is unleavened bread?" "On all other nights we eat vegetables and herbs of all kinds. Why on this night do we eat only bitter herbs?" "On all other nights we never think of dipping herbs in water or in anything else. Why on this night do we dip the parsley in salt water and the bitter herbs in charoseth?" "On all other nights we eat either sitting upright or reclining; why on this night do we all recline?" The parents will answer these questions with many explanations. A traditional Seder can take up to four hours with the reading of stories, poems, and prayers. These are the ten plagues that the Most Holy, blessed be His Name, brought on the Egyptians in Egypt. As each of the 10 plagues is read, a drop of wine is poured from the cup, or the small finger is dipped into the wine cup and a drop is put on the plate for each plague. Each one of these plagues represented a false god the Egyptians worshiped. God was rubbing their noses in their phony worship. The ultimate tragedy for the Egyptians was the slaying of the first born. Not only the first born people died, but also the first born among their animals. Most of you reading this paper have seen a new born or very young baby. You know how precious the baby is to its parents. On the original Passover night, new born babies died if they were the first born in a fmaily. Old people, if they were the first born, also died. Wailing could be heard from one end of Egypt to the other as families saw their first born die. Some people might ask, "Why would God do such a horrible thing?" The Egyptians were people just like you and me. Their hearts were broken with the loss of their loved ones. What we see happening on that night is a picture of God’s judgment on evil. Throughout Scripture God warns people of His judgment. Unbelievers reject the idea that if there is a God He would judge them harshly. The slaying of the first born is an example that God will punish sinners. Not only in the body, but as the Scriptures teach, for eternity. You might be one of those who refuse to accept this. Seek the truth before it’s too late. The Hebrews did not suffer the loss of their first born if they obeyed Moses' instructions and applied the blood of the lamb on their door. Lambs were very valuable to the Israelites. Though it is not recorded in the Scriptures, it is possible that one of the Israelites refused to believe Moses and didn’t apply the blood to his door. Because that household were sinners like the Egyptians and even worshiped idols (see Exodus. 32 describing the golden calf worshiped by the Israelites), their first born would have also died that night. The ONLY thing that protected them was to believe God and apply the blood of the lamb to the top and sides of their doors. Believers in Yeshua/Jesus can sing: "If He had merely saved us, but had not given us the Holy Spirit, Dayenu, we would have been satisfied." The Old Testament lamb was taken out from the sheep and the goats and was brought into the house on the 10th of Nisan and was examined to be certain it was a male in the prime of its life without blemish and spot. It was then sacrificed on the 14th of Nisan between the evenings (3 P.M). Not a bone of its body was to be broken. It was then totally consumed so that no part remained in the morning on the Sabbath of the Feast of Unleavened Bread. The lamb's blood was placed on the top and sides of the door posts of the Hebrew homes. When God passed over Egypt at the original Passover, He saw the blood and did not slay the first born of the Hebrews. He passed over their homes while he slew the first born of the Egyptians. Because Lamb is not allowed to be eaten at an Orthodox Passover Seder, a Lamb’s shank bone is substituted. The reason for this is because God forbids the offering of sacrifices except at the location He would choose. This turned out to be the Temple Mount in the City of David, which is now controlled by Muslims in present day Jerusalem. Lest there be any appearance of offering a sacrifice anywhere else, religious Jews refrain from eating lamb at the Seder. The New Testament Lamb (Yeshua/Jesus) was born in Bethlehem, the same place the Passover lambs that were to be sacrificed for Passover were raised at that time. He and was taken out from the tribes of Israel and entered into the city of Jerusalem on the 10th of Nisan (Palm Sunday), the same day the sacrificial Passover Lambs were brought into Jerusalem by the Pharisees. He was examined by the Sanhedrin and the High Priest, by Herod and by Pilate, and no fault could be found with Him. He was a male in the prime of His life and was without blemish or sin (see 1 Pet. 1:18-19). He was slain between the evenings (3 P.M.) and not a bone in his body was broken. His body was taken down so that it would not be left until the Sabbath. The blood on the door forms a cross. God could have said make and x on the door, or a circle, but by putting blood on the top and sides of the door, it forms a cross. The blood on the door in Exodus 12 protected the Hebrews. Jesus died on a cross, the same symbol as the Passover. What is the result of believing in Jesus? God’s wrath will pass over us on the day of judgment. The same result as the original Passover--praise the Lord Almighty for His grace! If a person was being crucified it was an agonizing, slow and painful death. In order to prolong the punishment, the Romans would put a wooden platform under the feet of the victim. In this way the person could lift himself up in order to breathe. If they just hung there the pressure on their lungs would create a condition called pulmonary edema. Without lifting himself up, fluid would fill his lungs, and he would literally drown in a short time. When the Roman soldiers deemed those being crucified to have suffered sufficiently, they would break the legs of the victims, and thus they would die quickly. No one takes it [my life] from me, but I lay it down of my own accord. I have authority to lay it down and authority to take it up again. This command I received from my Father. When Jesus had finished taking our sins upon Himself, he chose the moment when His soul would depart His body. When the soldiers came to Him to break His legs, they saw He was already dead and left His legs alone. Thus, in every detail Jesus fulfilled the prophecy of the original Passover Lamb. The possibility of all these parallels between the original Passover lamb and the life and crucifixion of Jesus are beyond calculation. This is one of the powerful testimonies that Yeshua/Jesus is "the Lamb of God who takes away the sins of the world" (John 1:29). And these are only a few of the over 300 prophecies Yeshua/Jesus fulfilled at His first appearance. This Matzoh which we eat, what is the reason for it? It is because God commanded that we not eat food with leaven, and there was not enough time for our fathers' dough to rise when the King of all Kings appeared, when the Holy and Blessed One redeemed them. As the Scriptures say in Exodus 12:39, "With the dough they had brought from Egypt, they baked cakes of unleavened bread. The dough was without leaven because they had been driven out of Egypt and did not have time to prepare food for themselves." At the Last Supper/Passover Seder, God set the stage 1,500 years before Jesus' final meal, that the bread that Jesus would use to initiate communion would be unleavened. 1 Corinthians 11:24 (NIV) states, "and when he had given thanks, he broke it and said, 'This is my body, which is for you; do this in remembrance of me.' " This bread represented His true spiritual condition--spotless and without sin. In 1 Peter 1:18–19 (NIV) we read, "For you know that it was not with perishable things such as silver or gold that you were redeemed from the empty way of life handed down to you from your forefathers, but with the precious blood of Christ, a lamb without blemish or defect." If Jesus had committed one sin in His life, he would not have been eligible to die for our sins. Because He was sinless, He did not have to die. He voluntarily laid down His life so those of us who believe in Him could receive God’s forgiveness and the gift of eternal life for our souls. When we take Communion, it is a reminder that the Pure One makes us clean before God the Father. Take the bread, rejoicing in our acceptance. Ephesians 1:6–7 (NIV) states, "to the praise of his glorious grace, which he has freely given us in the One he loves. In him we have redemption through his blood, the forgiveness of sins, in accordance with the riches of God’s grace." This Maror which we eat, what is the reason for it? It is because the Egyptians embittered the lives of the Israelites in Egypt, as the Holy Scriptures say in Exodus 1:14: "They made their lives bitter with hard labor in brick and mortar and with all kinds of work in the fields; in all their hard labor the Egyptians used them ruthlessly." We usually use hot horseradish. The bitter herb is supposed to be strong enough to bring tears to our eyes, to remind us of the bitterness of slavery. In case the horseradish is not strong enough, we also place an onion on the center Passover plate. The onion can be peeled and passed around near our eyes to makes sure we get some tears. Truly, we can say "Hallelujah" for the great redemption which God has wrought on our behalf, redemption at a terrific price: in Egypt, by the death of the firstborn; in the New Covenant redemption from sin, by the death of God’s Son. "For God so loved the world that he gave his one and only Son, that whoever believes in him shall not perish, but have eternal life" (John 3:16). We also prepare a sweet mixture of apples, honey, raisins, nuts, and wine, called charoseth. This mixture represents the mortar that was used by the Hebrew slaves to build pyramids and other buildings for the Egyptians. Charoseth is then mixed with the remaining horseradish and eaten together with some matzoh. Why make something sweet that represents part of slave work? The Jews remember that when Joseph was dying in Genesis 50, he prophesied that one day God would deliver the Jewish people out of Egypt. Genesis 50:24 (ESV) reads, "And Joseph said to his brothers, 'I am about to die, but God will visit you and bring you up out of this land to the land that he swore to Abraham, to Isaac, and to Jacob.' " The sweet mixture reminds us that while in the midst of suffering there was the sweet promise of God's deliverance, and He fulfilled His Word. As Christians we can remember Philippians 4:6–7 (ESV): "Do not be anxious about anything, but in everything by prayer and supplication with thanksgiving let your requests be made known to God. And the peace of God, which surpasses all understanding, will guard your hearts and your minds in Christ Jesus." Jesus took the third cup (this is taken traditionally after the meal--the four-cup tradition to remember Exodus. 6:6-7 was in place by the time of Jesus) to initiate the communion cup. 1 Corinthians 11:25 (ESV) says, "In the same way, also he took the cup after supper, saying, 'This cup is the new covenant in my blood. Do this, as often as you drink it, in remembrance of me.' " When you participate in the Lord’s Supper, you are actually taking part in a Passover Seder. Jesus used the traditions of the Jewish people to establish an ordinance for the Church. After dinner the children will hunt for the hidden Matzoh (Afikomen). When a child finds it, he bring it to the leader of the Seder and receives a small financial reward. Then the leader takes the Afikomen and breaks it into small pieces and passes it out to the people saying. "Take and eat." This matzoh is the last thing eaten at the meal. These are the very words that Yeshua uttered when He distributed the matzoh. What could this hidden Afikomen represent? We get a hint from the meaning of the word Afikomen. As a child I was told the word meant "dessert." The word is not Hebrew but Greek, and Greek experts are convinced that the word means "he has come" or "he will come." The first century church was primarily Jewish. These Jewish Christians didn’t stop celebrating the Jewish feasts. They realized that the Passover was a prophetic picture of the atoning work of Jesus. The reason the traditional Jewish community doesn’t have a clear idea of what the Afikomen ceremony means is because it was instituted by the Jewish Christians to remember the death, burial, and resurrection of Jesus. The three layers represent the Father, Son, and Spirit. The middle section, the Son, is broken and wrapped in a white cloth, just like Jesus' body was wrapped in a white cloth. Then the matzoh is hidden, just like Jesus' body was hidden in a cave, and then it is brought back out, just like Jesus' resurrection. Also, at the Last Supper, Jesus took the matzoh and broke it to represent His body. Right in the midst of the traditional Jewish Passover Seder there is a picture of the Triune godhead, and the death, burial and resurrection of Jesus. The Jewish people see this as a prophecy relating to the coming of Messiah. When Messiah comes, they believe the Jewish people will be set free from the persecution and hatred they have experienced throughout the last two thousand years. The hope is that at each Passover, which is the celebration of freedom, the Messiah will finally appear. Jesus proclaimed that John was the fulfillment of Malachi 4:5-6 in Matthew 11:14 (ESV): "and if you are willing to accept it, he [John the Baptizer] is Elijah who is to come." Jesus will come again to take up the throne of David as promised in Isaiah 9 and 11. He will reign forever and His Kingdom is everlasting. I pray that all who read this paper will believe in Yeshua/Jesus and be saved or are already saved.